Beginning at any point on the hat (I usually like to begin at the tip of the earflap), SC around hat and earflaps, fasten off weave in ends. 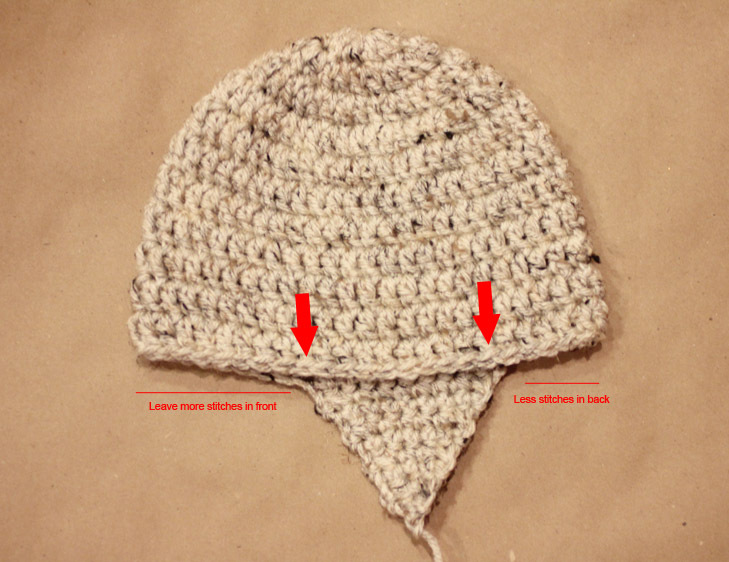 Second earflap placement: Fold hat in half leaving slightly more stitches in the front of the hat than the back. Place the second earflap to line up with the first earflap (between the red arrows in this picture). Braided Tails: Cut three 1 yard strands of each color (9 strands total). Pass through last space in earflap. You should now have 18 strands to braid with. Note: It helps to make 2 SC in each bottom corners. Sew the inside of the ear to the outside of the ear but be careful to sew only on the inside stitches so the yarn doesn’t show through the outer ear. Sew finished ear to hat. I placed mine at about the 3rd round. Round 2: 2 HDC in first two stitches, 2 DC in next 4 stitches, 2 HDC in last two stitches, join to first HDC, fasten off leaving long tail to sew onto hat. To make the eye patch larger, continue with Round 3 by making 2 SC or HDC (depending on how big you want it) in each stitch around. 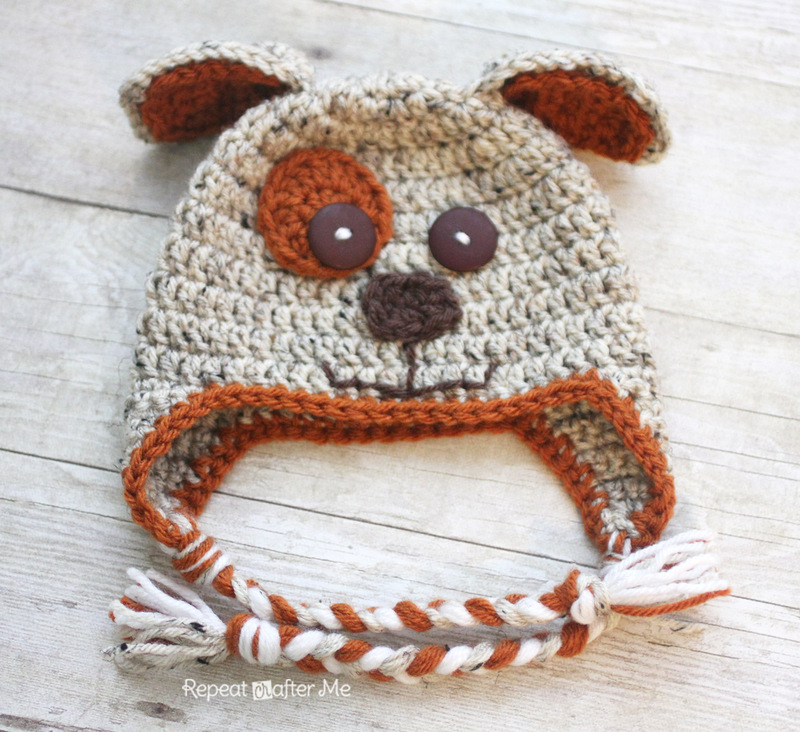 Want to make a puppy love hat? 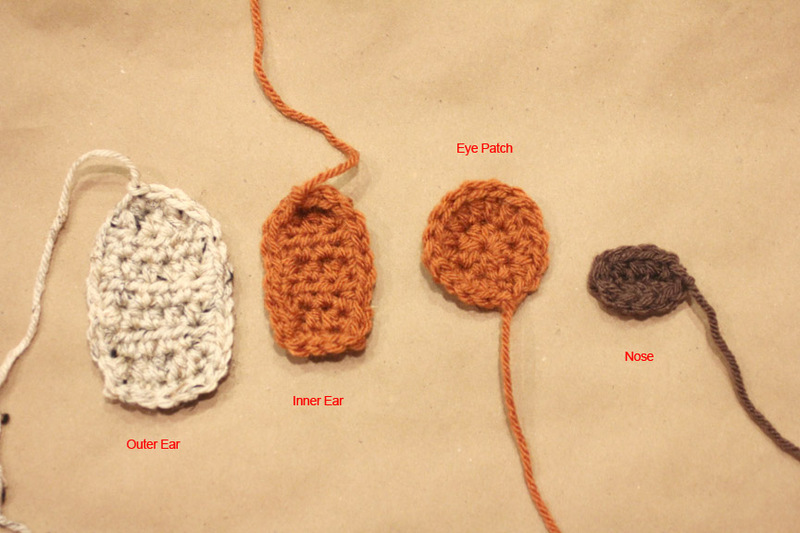 Crochet a heart instead of a circle for the eye patch. I followed THIS free heart pattern but stopped after round 2.
now working on opposite side of chain, HDC in next 3, 2 HDC in last stitch, fasten off leaving long tail to sew nose onto hat. You're awesome! I've made your snowman,and owl hats. I was just looking for a doggy hat yesterday! Thank you! 🙂 I'v been crocheting for about six months now, I still need direction for little things two toned ears. Absolutley gorgeous!! I will be making one of these soon! Hi, i love you patterns!! I from Chile and i have a questions about sizes , what is the age for size toddler/preschooler, child and Teen/Adult. This is so cute! Best pattern I have seen for a dog hat! How do you put the two ear pieces together? Is there s tutorial for that and how to attach to the hat? Thank you so very much! I have so many people wanting some puppy hats and now I can give them what they want these are so adorable! Thank you! You are awesome at this! You are an inspiration! I'll be making these for my niece and nephew! I love your hats, they just keep getting better and better. Thanks! So cute…..thank you for the MANY SIZE CHOICES & thanks for sharing. E' bellissimo! !grazie mille per il pattern, ne farò uno per la mia bambina. Thank you so much for the adorable inspiration/pattern! I found you blog and I really loved all posts here!! Anyway, congrats about you blog!! Every day I will back here!! I hope to see there!! You are so kind to share with us and your patterns are just beautiful! Thank you so much! So so so thankful for all your free patterns! So cute! My little grandson will be getting one of these. They have been wearing their Gingerbread hats to death! They just love them! Thank you again for the pattern. Would you happen to have a good pattern for a brimmed hat? I've really never cared for the brims that I've put on hats, they don't seem to have any body. Thank you for the video!! Adorable pattern (as are all of yours), as soon as I showed my 5 yo the picture & told him the pattern was out, he started hopping around the living room "can you make me one?! Can you make me on pleeeeeeeease?!" Of course I started right then. I think I'm a little confused one how to make the outer ear though & which end of it to attach to the hat. I'll do my best to figure it out. Thank you for all the wonderful patterns, I really love them!! I’m having the exact same trouble with the ears. I think the point goes up, but that makes it difficult to sew on with the attached yarn. Soooooo adorable! Thanks for sharing the pattern and thanks for sharing at Submarine Sunday! fabulous, and so happy to see that you also do not count the ch2 as a stitch, and don't join to it either, that always makes holes and yet so many patterns still do it that way! Thanks so much for sharing on Craft Schooling sunday! This is so adorable just all the other ones you posted! I have one question….where did you get the brown buttons? I live in a small town. No craft stores around. Do you get them for a craft store or the internet? I really would appreciate your reply!!! I have a question: I look your hats are pretty rounded mines look wide. Any reason for that? And BTW I love all your croche works, I will share my baby owl hat once I finisched! Mine ended up really wide too. I can't figure out what I did wrong. Oh good grief, Sarah, this is so precious I can't take it! I have GOT to make these for my boys, and one for the new baby! You are so talented! And you've got some nice bling in that video :)! Great job! Thanks for sharing at Hookin On Hump Day! We love this sweet hat Sarah! Sarah-Thank you for being so gracious to share your ideas. I crochet for charity and the kiddoes will love this!! you are really good at this. thanks so much for the pattern. I am making the owl hat for my daughter and this is perfect for my 2 nephews. Soooooo cute! I have so many request to make the owl hat from the pattern you posted. I bet I've made 8 of them as Christmas gifts. 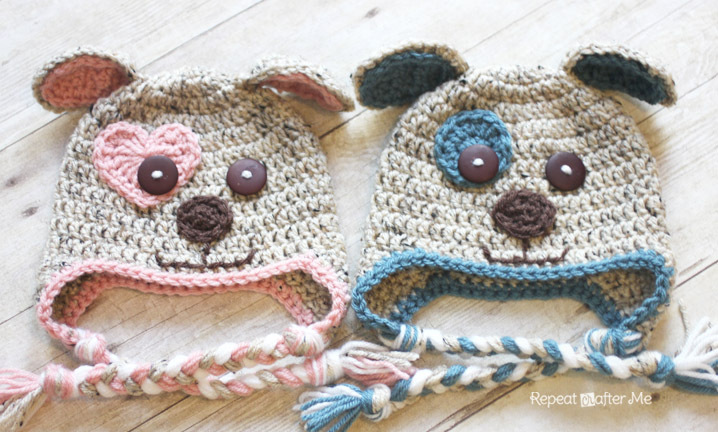 I'm going to make this puppy hat for my neice's baby that's due in April. Thank you so much! I love your hat! Thank you for publishing it for us. I do need your help though! I am a new crocheter and still struggling with the basics a bit. I make this hat for my 3 year old son (using the pattern for the preschool) and the hat is almost too big for me! Obviously my gage is out, but how do I know how to fix it? I know I need a smaller needle, but how do I know how small to go? Hi. I always know to go up a hook size because I crochet tight. If you hats are coming out too big, try going down a hook size or 2. Once you feel it is at the size it should be then you know how to adjust for patterns. 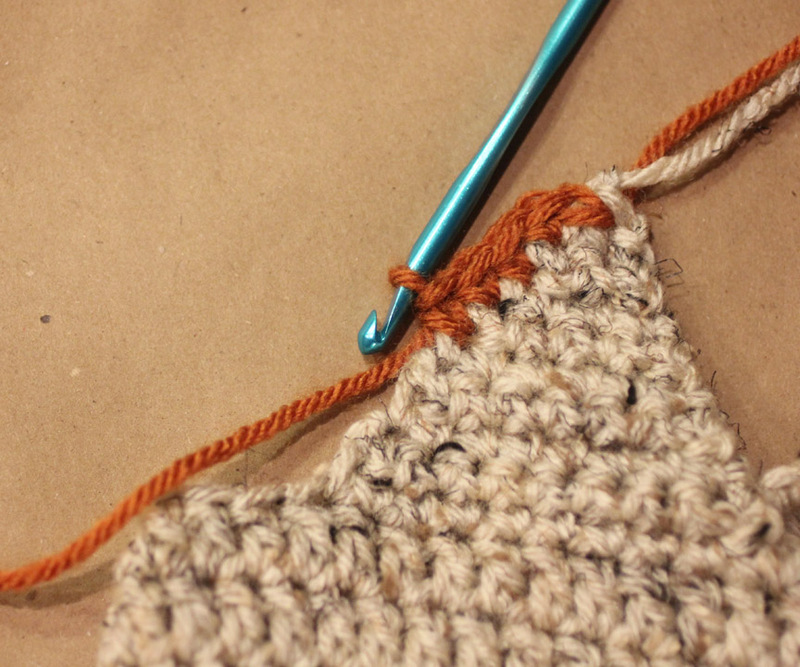 I ALWAYS have to go up a hook size…not just for these patterns. Hope this helps. The preschooler size should fit a 1-3 yr old. LOVE this!!!! I made this for a friend for her new baby boy arriving in a few weeks, and she just LOVES it. Thank you sooo much for all your free patterns and other crafts. I just love checking to see what is new that you're doing! Really looking forward to the new bunny pattern!! I love these! They are awesome! I did find a trick with the heart patch though that I wanted to share. I always found that I ended up with a circle or hole in the middle of my heart that I didn't like. Maybe it is just me, but I couldn't seem to make it go away. What did finally work is I used the magic circle! I chained 3 and then followed the directions only doing the stiches into the magic circle instead of the first of the 4 chains. Works awesome! Flawless heart everytime! Very cute indeed! Thanks for sharing. I just finished your puppy dog hat. I had tried the owl and it was so cute I had to try this one. I think it's not too bad for first animal hats. My kids love them. Thanks for putting them on here. I enjoy them. I have a baby shower to attend in five days and wanted a "little something else" to go with the main present. As we are all waiting until the birth day to find out girl or boy, this hat will make a perfect gift. You are so creative. Thank you. Thank you soooo much for this pattern…not to mention the pictures! I have just finished the hat part and am going to start the ears and eyes! Thank you for the pattern; I just finished a newborn pink puppy and it turned out very cute. I added a bow to the left ear and used Loops & Threads country Loom in a darker pink for the heart eye, nose, and inner ear, also used it for the braids. This yarn gave the hat some dimmension. Thank you again for the pattern. Thank you for all your wonderful patterns. I have made the owl hat several times in all the sizes. This is my first time making the puppy dog pattern and it turned out so cute! I also made the monkey hat and it is so cute! I love all the patterns you have on here. They are so cute. Thank you so much for all these wonderful patterns. Love this! I am starting on it right now! I just made one in a 0-3 month size, it's so cute! I did notice that you don't need as much length (the 1 yard requested) for the braids, but I just cut them down to size for the tiny hat. Thanks for such a fun pattern! Thank You so much for this pattern, I enjoyed making him so much! I think the owl will be next! This is such a great pattern! I shared it on my blog, hope that's ok? Any patterns for a kitty hat? I'd love that pattern! This is a great pattern, thank you. I have a question on the ear flaps, thought I see you didn't answer another great question in the comments (about the ch2 at the end of the pattern) so I'll probably just figure it out. It says "Ch1 turn" only at the end of the decreasing rows, but not at the ones that are SC across…. don't I still need to turn at the end of each row? This pattern is NOT FREE! I'm sorry, but when I gotta put up $8.99 FOR A GUEST PASS, then the pattern, at least as far as I am concerned, is not free at all! That makes this deceitful in my mind. What a horrid way to drive traffic to a 'site'. I will take a pass on it, thank you very much! Thank you very much for this pattern, I've made ​​very easy with your explanations. You can see it on my blog: http://embolicalatroca.blogspot.com.es/2013/10/barret-de-ganxet.html Thanks again. Thanks so very much for sharing your patterns, also the tutorial for attaching the nose and eyes. I haven't found a tut for that. I made a sponge bob hat and I wasn't thinking that there was a front and back, and the eyes didn't look like I wanted them to. hi I love this hat , I'm making one and I have a question, I don't really understand how to make the ears, do you have any video about how to make the ears and how to sew them on the hat? Thank you for sharing your patterns I really love them all.. I used your basic pattern to make a hat for my baby's Halloween costume. Thanks! Thank you for generously sharing your beautiful patterns. I loved making your owl hats now look forward to crocheting more patterns. Next hat : zebra ! Thanks so much for writing such an easy to follow pattern! I loved making this hat . . . it was my first ever attempt. I can't wait to make an owl hat now . . . and I'll be making another puppy hat as well! I really appreciate your generosity for posting this on your blog for FREE!! Simply amazing! Thank You very much for this patterns. My first hat for my little girl is finished. She likes this pappy hat !!! This is my first hat and I can't seem to figure out the ears. Do you have a video I can that will show me how to do the puppy dog ears? Thank you so much. wondering how do you come up with the increases tried to make my own hat patterns but they never turn out as nicely shaped as your I thought you might have some tips thanks and keep up the great work! You create the cutest things! I've made so many of your hats! This is the first time I've made the puppy hat though 😀 Thanks so much for sharing your super creativeness! This hat is incredible! I love it! I'm going to make it. If I end up featuring it on my blog after I'm done, I will link to your tutorial and let you know. Thanks again! I'm excited to make this hat! I made this hat for my little grandson, it looked adorable on him! This pattern is so easy. Thank you! I love your hats, they are easy and fast. Thank you for sharing! I have been using another one of your patterns to make owl hats and they have been a hit. Thanks again. Hi, I love your sight and find many adorable patterns that I love to create. I am an experienced crocheter, over 25 years; however I do have a problem getting the puppy hat to gauge. I have made several times with different hooks and yarn. Has anyone else had this problem? They always come out to big! I hate when things like this beat me…lol! Any suggestions? I got it to work with red heart super saver (what i had access too) and an F hook. I’m new to crocheting and made most of the hat before I figured out it was too big and open! This hat is adorable! I just finished one tonight and it is so cute I hate to wrap it up and give it away! 🙂 Thanks so much! I am your newest fan 🙂 Love, love, love your little puppy cap pattern. Made two cute little ones for two sweet little boys. Thank you so much for sharing your talent. I wrote a post about them if you'd like to come over and check it out. Thank you again. Wishing you a wonderful weekend. hi I totally love this pattern. I am finishing it for my little girl and thanks for sharing it. Thank you , thank you for sharing this adorable pattern! I've been looking for a hat to make for a very, very special baby. It's a long story, but I adopted a baby girl who had been born with a very serious birth defect, nearly a half century ago. Her birth parents were very young and we had no contact, as was the case with many adoptions back then. A few years ago, my daughter and I searched and succeeded at locating her birth parents. Neither of them had had any more children, because they were afraid the same thing would happen. Her birth defect was so serious that many children die of it, and those her survive often have long-term problems, so they were really shocked, pleasantly, to hear that they had a happy, healthy, beautiful, daughter, who wanted to meet them. Well, seeing how well things turned out with her made her birth father start thinking. He was so young when she was born, that he and his wife were still young enough to have a baby. That baby was born a few days ago, and he's healthy and perfect! I wanted to crochet him some special hats and booties to keep him warm this coming Winter, and your puppy hats are PERFECT! I'm going to start on it right away! I have linked your page from my blogg. Hi. Thank you so much for sharing so many patterns. Did the rudolph applique yesterday, it's really cool. I have a question on the hat sizes. Have you got any measurements of what size the hats should measure as a guide line as there are so many conflicting sizes on line. Sorry for being awkward. Is there a tutorial on the making braids for the beanie? Love it! Need a cute puppy dog pattern that won't take terribly long to work up. This is adorable! Thanks! I made this hat and it turned out way too big for a baby. Now I have to redo it. Your patterns are awesome! Beautiful work, all of it! I can't thank you enough for sharing! I love this! I hope it’s okay that I linked back to it in my blog post. Please check it out! Thanks! filled using a powder called grout. Love your patterns for hats!!! I was wondering, since I know I have not seen all of your hat designs, do you have a child’s hat that is done in all SC?? I just want to say I love the pattern for the puppy dog hats, I’m in the process of trying to make them for my grandchildren but can’t seem to get the seam straight. Is it going to be slanted with each row added stitches or straight? Please help ! Thanks for posting this pattern – and for the video instructions. What a great pattern! I’m going to make it for my baby nephew for Christmas. Thanks! Made you hat today for my friends son. I love love love it and I loved you pattern, very clear. I’ve only been crocheting for a few weeks now and had to trouble with it! Wish there was a way to post a picture of it! This is a great hat. The instructions are super easy to follow, thank you for sharing. I have a question. What is the easiest way to line the ears up? I am having trouble sewing those on. How do you print off the pattern? I LOVE the puppy pattern. I made it for my great nephew. It turned out great! Thanks so much for the pattern and instructions. It’s been awhile since I’ve crocheted, but now I’m addicted again! Please please please help me. My grandsons birthday is coming up soon and I’m looking for a bubble guppies crochet beanie pattern but cannot find anywhere. Where can I get one? I can’t follow instructions so need to see the drawings or follow a tutorial. I ask u humbly to help me. I live in South Africa . I have the owl pattern downloaded also and I have notices that the instructions are slightly different (the dog pattern is slightly larger). Is there a reason for this? I would think they would be the exact same pattern. Cute nonetheless. Thanks for the patterns! Hi! thank you so much for this cute pattern!! I am new to crocheting. Do you work in both loops or just the front or back? Hello, I made a Stormtrooper hat pattern with this base. I put link to your blog, but I have translated into Catalan and explain a little different. I just finished crocheting your chunky check hat for my great niec who just turned one on February 18/17. The hat is so adorable with its big eyes. It should be received in the mail within a few days and I would love to see the reactions to it. Love it and will soon be starting a new hat pattern. You have such a vivid and creative imagination, Sarah! Live the puppy hat pattern!! Do you have an elephant hat pattern? Do you use a yard for each side of the braid or do you use the 9 pieces. Then cut them in half and use them to make both braids on the hat? Do you have a tutorial on sewing the inside of the ear? I’m relatively new to crochet, having only really made a blanket before. I’ve just finished this puppy hat in an afternoon- thanks so much for the wonderful pattern! Thanks for the free pattern. I changed it a bit and made it Brittany Spaniel color. I just winged it and it was right the first try. Don’t ask me how, I did not take notes. I also made eyes out of yarn, cuz I don’t like buttons where babies might get them. article. Ƭhank you for supplying thbis info. I’m confused regarding the directions for the ear flap on the snowman hat. Ch 1, sc in next 10, ch 1. Do I start with a magic circle? Where do I sc in the next 10? You use Scribd for your uploads!! That’s awesome, I actually work there. Thank you so much for sharing this pattern. I’m going to be making it for my niece as a Christmas present. Can’t wait to make this! Thank you so much for your adorable crochet hat patterns, Just made the crochet puppy hat pattern, I’m really pleased with the way it has turn out. l am going to try another one. Thanks for the easy to follow pattern. This was better than some I’ve paid for.